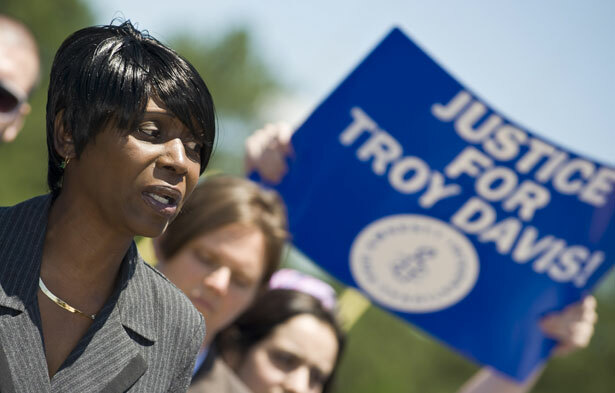 Even after her brother, Troy Davis, was executed, Martina never stopped fighting the death penalty. Yesterday, she lost her fight against breast cancer. When Martina Correia was first diagnosed with breast cancer, her son, DeJaun, was 6 years old. The doctors gave her only six months to live. But more than ten years later, she was still alive. Death was not an option for her. She was on a mission, not just to raise her son but to save her brother’s life, even as her own life hung in the balance. It was not just the shocking facts of Troy Davis’s case—the total lack of physical evidence, the recanted witness statements—but his sister’s strength and story that inspired a global movement against the death penalty. People all over the world cried out against the execution of Troy Davis. Not once, not twice, not three times. But four times. Martina never paused, never put herself first. It was always about the fight. When I wrote to a dozen activists, lawyers and former prisoners this past February asking for a short contribution to an anti-death penalty article for The Nation, she was the first to respond, even though she had been very sick. “I am not yet 70% of myself,” she wrote, as explicit an acknowledgment of her health struggles as she would generally allow. Yet she urged me to call her cell rather than e-mail in the future; it was a better way to reach her. As a board member of the CEDP, Martina would join our lengthy Sunday night conference calls—no matter where she was or what was going on. She spoke to us from the car, on her way back from the hospital—she was always there. So it was easy to convince ourselves she always would be. In person, Martina stood tall, a veteran of Desert Storm, where she had worked as a nurse. It was painful this September to see her looking so frail as she watched the state of Georgia prepare to kill Troy once and for all. Too weak to walk, she nevertheless rose from her wheelchair in a show of strength and solidarity. “I’m here to tell you that I’m going to stand here for my brother today,” she said as reporters looked on. And she did. Soon after that, her brother was gone. After so many last-minute reprieves, it was a reality that was too hard to accept. Just as it is difficult to accept that Martina is gone. “I never thought this day would come,” DeJaun tweeted earlier this week, as he heard from the doctors that she didn’t have much time. Along with Martina, he had spoken to the CEDP over the phone at our annual convention last month, and told us his Twitter address. It was his feed that told me she would be gone soon. As the news spread last night, another tireless activist, my friend Marlene Martin, former executive director of the CEDP, sent out an e-mail describing one of her last conversations with Martina. Martina fought her deteriorating body every step of the way to hold onto life and to be in this world for her family and for the human family. Her body finally gave out, living eleven years longer than doctors predicted she would. It is unimaginable what stress and hardship she and her family faced having a loved one on death row who was almost executed three times, then finally killed by the state she called home and in the country she served as a military and civilian nurse. Martina’s mother, though in perfect health, died shortly after Troy Davis’ final appeal was denied and a few months before his execution. The families of murder victims and the families of death row prisoners endure enormous pain. The death penalty is horrifically destructive, creating a downward spiral of violence that drags so many people down in its wake. We must end it so that an authentic justice that brings us accountability, healing and a better future can take root and blossom.